This time the spotlight will be shining on BOSSES FOREVER 2.BRO, a co-op enabled endless… boss battler? Uh, right. Let’s see if we can’t help it escape the cold emptiness of Greenlight limbo, where it’s been for over a year! BOSSES FOREVER 2.BRO is the co-op update to the original BOSSES FOREVER. Now you and your buddy can face off against menacing bosses that learn how to fight you as you play. With every action determining the boss’ power, attacks, and techniques, no two runs in BOSSES FOREVER 2.BRO will be the same. Endless games aren’t really my thing, but in spite of that, this one still managed to pique my interest. Maybe it’s the crazy co-op action that takes place as you fight boss after boss after boss (you get the idea) with a friend, blasting pixellated menaces until your inevitable doom? Nah, I’m sure it’s the upgrade system as well as an AI that constantly evolves and adapts – or maybe it’s all three? Yup, that must be it. Oh and those hair styles are seriously straight out of an 80s music video! Like in the good old days, there are no continues, extra lives or second chances in BOSSES FOREVER 2.BRO. Just you (and a friend?) 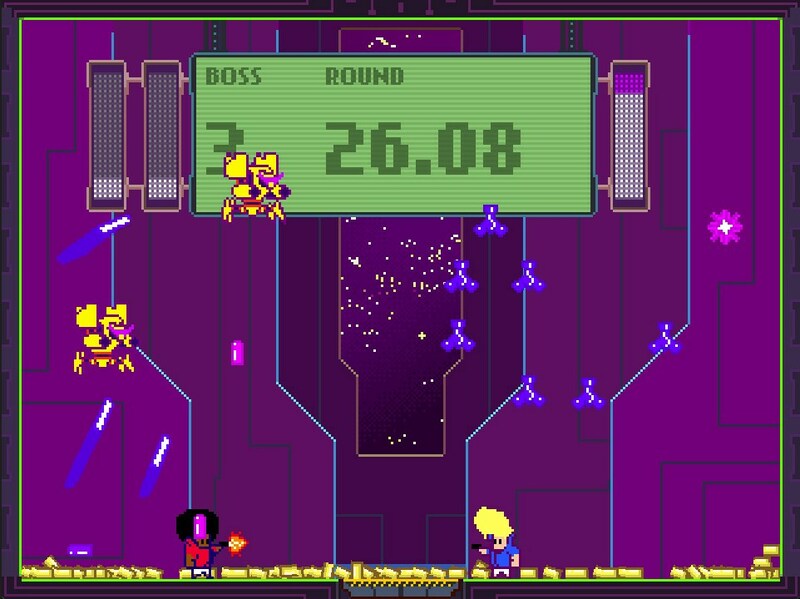 against a relentless onslaught of ‘bosses’ in a fast-paced and incredibly violent fight… to the death. Your death, that is. So riddle me this, dear reader: why is BOSSES FOREVER 2.BRO still struggling to get through Greenlight? It’s been out for a while (since December, 2013), so lack of availability is certainly not the reason. If you haven’t done so already, might I recommend visiting its Greenlight page and handing over a ‘yes’, if you like what you see? Remember: your vote matters! BOSSES FOREVER 2.BRO is available for Windows, Mac and Ouya from the official website, priced at $0 and without DRM.